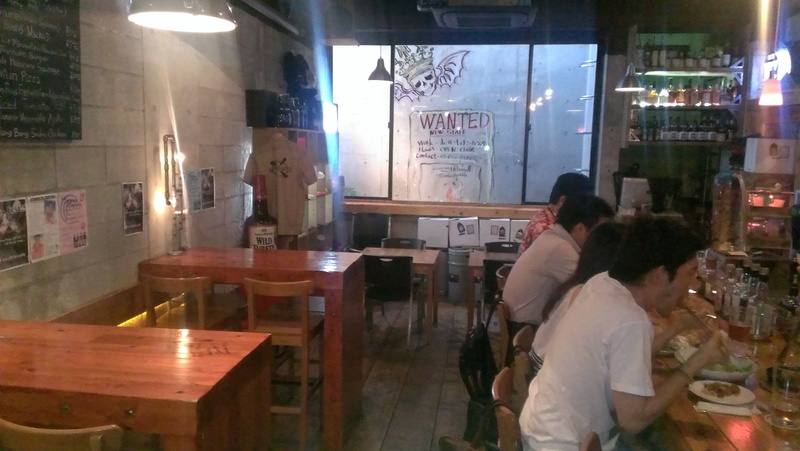 Craftheads has been open since September 2009, sprung up from Bar Sal in Kawasaki, and is located about 10 minutes from the Hachiko exit at JR Shibuya station. 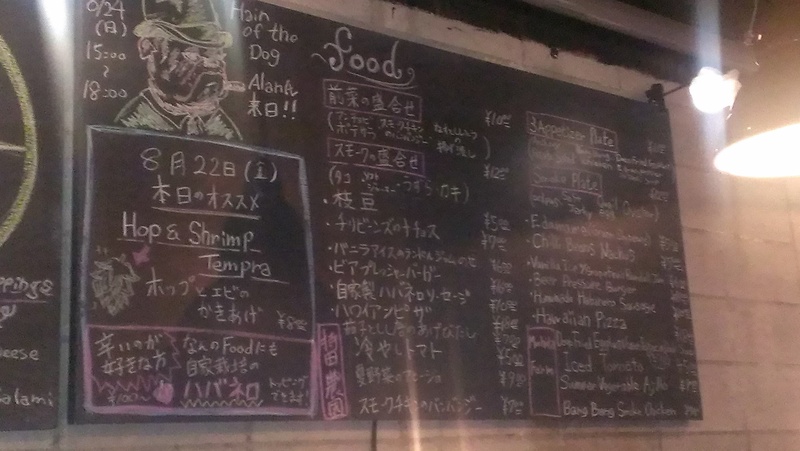 Craftheads sells a mixture of Japanese and import craft beers, with over 20 taps at any one time, and also a wide selection of craft beers, predominantly from the USA. When the bar seats opened up, people were very quick to move to the counter. The bar itself is quite spacious, with about 15 seats at the counter, and various tables around the outside. People were eager to move from the outside to the counter. BeerTengoku went on a Friday night and even at opening time at 5pm, Craftheads was beginning to fill up with a predominantly Japanese crowd. The bar is also non-smoking, so you have to go upstairs to smoke; however, Craftheads does also have free Wi-Fi, so you can update your Instagram, Tumblr, Untappd, or whatever the cool crowd use to tell everyone where they are. Hope you like your IPAs as that was all that was pretty much on tap. Unfortunately, the day BeerTengoku went, Craftheads was doing an IPA only week. Which would have been nice, except that the IPA week started on 5th August, and was still going 3 weeks later. Now, I like my IPAs as much as the next person, but to dedicate 20+ taps to IPA without any other options seemed a bit of a poor decision really. 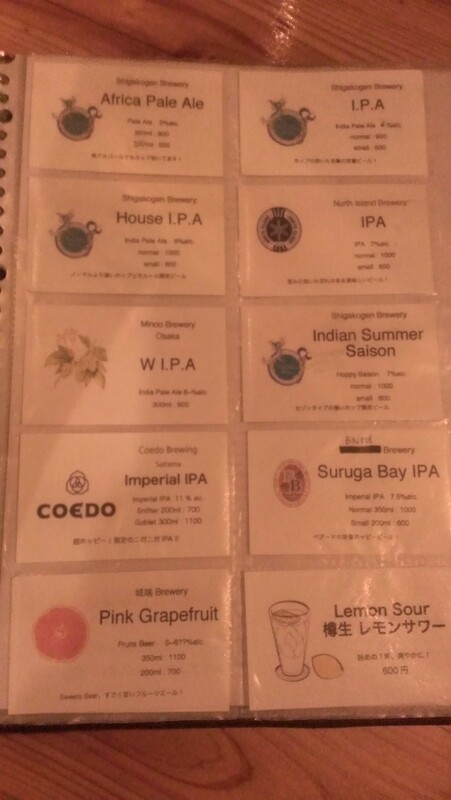 In terms of Japanese craft beers, Shiga Kogen, Coedo, Baird, and Minoh were on tap, but just their IPAs. There were various different sizes of glasses at Craftheads, which got very confusing during ordering; a snifter at 200ml glass, a small at 200ml, a small at 300ml, a goblet at 300ml, and a normal at 350ml. It would have been nice to have seen pictures of the glass sizes next to the labels that other bars offer as, let’s be honest, after a couple of beers, your vision is not that best. Craftheads offered a very extensive food menu that changes daily and also depending on the chef’s recommendation; however, the staff were not the most helpful in trying to order a large portion of the chill bean nachos. Even though the menu was written in English, when we asked for a large chilli bean nachos, it caused 5 minutes of confusion that ended up with BeerTengoku paying for a large portion, yet receiving a small size which would barely accommodate for one person. With high prices for small glass sizes, it’s hard to recommend Craftheads on our recent visit. I would actually go so far as to say avoid the place. There are much better bars in the area to get your craft beer fix. If you really don’t mind paying over the odds, then you’ll feel right at home in Craftheads, else try Good Beer Faucets, Watering Hole, and even Urban BBQ Smokehouse for beers and food at good prices and good sizes. Yep, that sounds like craftheads. Haven’t been back since and not in a great urge to either.